deny me admittance to Paradise. then do not deny me the Bounty of Your Eternal Beauty. 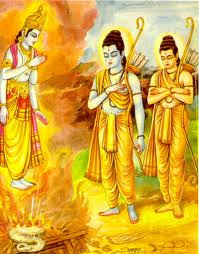 By looking at whom, the world feel very pleased; to that Shri Rama, I bow again and again. To the chief of Raghu clan, To the lord of all the worlds, And to the Lord of Sitā. Who has a divine arrow and a beautiful bow in His hands, I pray to that Shri Rama who is the Lord of Raghu dynasty. Above three shlokas (verses) should be recited every morning as regular prayer to Shri Rama before chanting the Guru-Mantra. The first Mantra is infallible Mantra in removing all kinds of sufferings of Jiva and bestows the grace of all merciful Lord Rama, the most superior. The second Mantra is one of the greatest Mantra-s of Lord Rama. The 2nd one can be repeated as many times a devotee want with pleased mind. 3rd Mantra is Dhyan Mantra i.e. meditation Mantra on all attractive form of Lord Rama. During chanting this mantra, one should meditate on Lord Rama as described in the Mantra. This Mantra has a very deep meaning too. It represents whole Ramayana in one single verse. How does it reflect the entire Ramayana? Neelāmbuja Shyāmal Komalāngam : The blue lotus like soft body parts are of child Rama, thus it is the description of the Baal-Leela (child-sports) of Lord Rama. Sītā Samāropita vāma Bhāgam : By sages, Sita was given seat on the left Side of Lord Rama during their marriage, it is the description of the Vivah-Leela (marriage-pastimes) of Lord Rama. Pānau Mahāsāyak Chāru chāpam : By taking arrows and beautiful bow in his hands, Lord Rama slayed all the evil demons, It is the description of heroic exploits of Lord Rama in war i.e. Rann Leela. Namāmi Rāmam Raghuvansh Nātham : After killing Ravana, the coronation (पत्ताभिषेकं) of Lord Rama was done on the throne of Ayodhya, then Lord Shiva, Lord Brahma and all deities made salutations in the lotus feet of Lord Rama. Thus, it is the description of Lord Rama's Rajya-Leela (supreme lordship). It unveils also how Lord Rama becomes the delight of all the worlds. Whole world became the world of Lord Rama and Rama alone. After the Guru-Mantra or Ram Naam chanting, one should chant Dvaya-Mantra (द्वय-मन्त्र) of Bhagavan Shri Ram at least nine times. why to pray Lord Rama? Why to take the refuge of Lord Rama, alone? हे अमृत के पुत्रों (सभी मनुष्य)! सुनों! Hear, ye children of immortal bliss! भावार्थ : मैं अपने मन और वाणी को ब्रह्म से युक्त करता हूँ, मेरा यह श्लोक सूर्य के किरणों की भांति सर्वत्र जाए। हे अमृत के पुत्रों (सभी मनुष्य)! सुनों! हे दिव्यधामों के वासी देवगण! तुम भी सुनों! Translation : I unite myself with the eternal Brahman, who is the supreme source of everything (Vaak, and Mantras). Let my verse (prayer) go forth like the path of the sun. Hear, ye children of immortal bliss (all humans), even ye who dwell in higher spheres (devas)! Bhagavān Śrī Rāma is Rupa-sindhu (the ocean of all beauty-elegance-&-charm), Gun-Sindhu (the ocean of all virtues & qualities) and Sheel-sindhu (the ocean of intrinsically sweetest disposition and inherently noblest character), therefore he is the Ishta for one and all-beings. Lord Rama is the only one fit to be taken shelter of for all the worlds. It is the conclusion of all great divinities such as Maha-deva Lord Shiva, Lord Hanuman, Lord BrahmA, Shukadeva, etc in Vedic scriptures, and also approved by Godly sage Brahmarshi Valmiki through the mouth of Maharaj Vibheeshana in Yuddha Kaand of Shri-Mad Valmiki Ramayana. Please inform immediately to high souled Rama, who is the only one fit to be taken shelter of for all the worlds. So I have come to him (to take his refuge). Lord Rama, alone is the ultimate refuge for one and all, whether one is a god or a demon, a human being (a man, a woman or a child) or a creature other than human-being such as a beast or bird, or one belonging to differnt social status such as poor or rich etc. So who else apart from Lord Rama is suitable to be taken as ultimate refuge for Jiva-s? Lord Rama is Ishta-Deva of all deities including Lord Shiva, Lord Hanuman, Lord Ganesha, Lord Brahma, Lord Krishna etc. Proof from the self sufficient authority (Pramana), Shri Valmiki Ramayana:- इष्ट: सर्वस्य लोकस्य राम: (IshTa Sarvasya Lokasya Ramah)- means Lord Rama is the IshTa-Deva of all the worlds. Lord Shiva, Lord Ganesha, Lord Hanuman, etc have become the worthy of worship by chanting 'Rama' Naam alone. All the deities reside in Lord Rama as Lord Rama is Sarva-Devamayam which means Shri Rama is the origin of all the deities (demi-gods and Vishnu-Tattva-s). It means "All the deities reside in Śrī Rāma or Śrī Rāma is the original root of everyone . Śrī Rāma destroys all type of agonies of his devotees." Therefore, it is sufficient to serve lord Rama, the original cause of all the causes, the origin of one and all, the original root which supports all. The leaves and branches of a tree gets support and nourishment from its root, similarly Lord Rama is the root (origin) and support of the entire creation. There is none who has any independent existence beyond Lord Rama. When one worships the god of gods, Supreme Personality Lord Rama, then everyone will be satisfied. All the deities are pleased, when one takes refuge into the lotus feet of Lord Rama. Everyone becomes favorable on the devotee of Shri Rama. No god is superior than Lord Rama. Lord Rama is the root and origin of all the deities. It is sufficient to serve the root rather than serving the individual leaves. Serving the leaves in independence of serving the root might be the waste of time and energy, moreover it has been said that fruits of serving other deities except Lord Rama are also doubtful. If one gives water to the root, it nourishes all the leaves, fruits including other parts of a tree. So, if one worships the cause of all causes i.e. the most superior Lord Rama, all dieties will be automatically pleased, as they themselves worship the Supreme personality of godhead Lord Shri Rama. Therefore, it is any time better to be a devotee of Lord Rama, and loving and worshiping the most superior Bhagavan Shri Rama. How can one take refuge of Lord Rama? How can one become his devotee? One needs to just say : "O' Lord Rama, I am Yours", only by this much one can take refuge into lotus feet of Lord Rama, one can become devotee of Lord Rama, and Lord Rama will be of that person. Then, there would be no fear of anything as soon Rama become Yours. This is also solemn pledge of Lord Rama in Shri Valmiki Ramayana. He who seeks refuge in me just once, telling me that "I am yours", I give him Abhayam (fearlessness, assurance of safety) against all types of beings (including myself). This is my solemn pledge". Above verse is also known as Charama Shloka of Valmiki Ramayana. Once Jiva takes the shelter of the most superior Lord Rama, he has no need to worry about anything as Lord Rama has taken vow to protect him from all kind of fears. There are many deep imports of this charama Shloka of Valmiki Ramayana. It is also the essence of Vedas, Ramayana, and Gita. Lord says He bestows 'Abhayam', in Sanskrit 'Abhayam' has many meanings e.g. fearlessness, supreme protection in all conditions, and Abhaya-Padam (the liberation, the supreme abode). Abhayama is explained as Mukti (liberation) as only in Abhay-Padam (after liberation, in supreme abode) a Jiva has no Bhayam (fear from any being or worries or anxiety or insecurity of losing something). Therefore, Shri Rama assures I give him Abhayam i.e. the complete fearlessness from all beings, the state of being freed from all worries and anxieties of the material world as well as the Mukti (supreme liberation) i.e Abhaya-Padam. O' My Lord Shri Rama, I remember your lotus feet in my mind, I praise them by my speech, I bow to them with my head, I take resort in them! O' My Lord Shri Rama, You are my mother, father, Svami (master, Lord) and friend, indeed the kind-hearted Rama is all I have. I don't have any other relation apart from him, I really don't! Thus as soon as one says from heart "O, Shri Rama, I am Yours and You are mine", one becomes his devotee at that very instant. 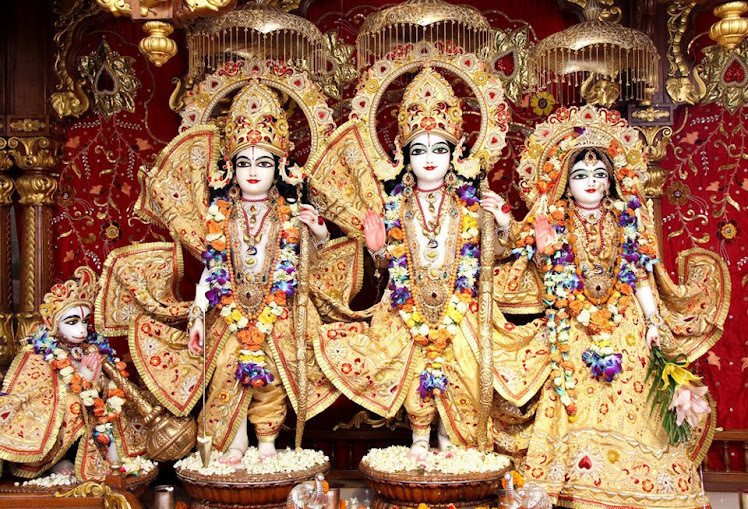 What is the fruit of being devoted to Shri Ram, the supreme personality of Godhead? When Lord Rama sees a Jiva with his benign look, then nothing more remains to be achieved as his look is supremely gracious and infallible (Amogham) for his devotees. Lord Brahma says "O' Rama, Your blessed sights on devotees are very powerful and infallible. The songs in praise of you never go invain. Those humans who are full of devotion to you will never be unsuccessful on this earth. Those who are devoted to you, the primeval (the first Lord) and the eternal lord, belonging to ancient times and the Supreme Person, will forever attain their desired objects here as well as hereafter (that even your supreme abode Saket Loka which is full of eternal supreme bliss Brahm-Ananda). Anything done for Sri Rama never goes in vain. Sri Rama is very kind, and He cares most his devotees, it is evident from his disposition that he even cried for his devotees for example in the case of GiddhaRaj (the king of vultures) JatAyu, LakshmaNa, and Sita etc. The vulture-king Jatayu sacrificed his life in the battle with the demon king Ravana for rescuing the beloved consort of Rama from the evil demon. If a devotee (Jatayu here) sacrificed his life, did the supreme service through his material body, and if lord would have just given him the supreme abode without showing any emotions or grief, wouldn't it be a mere heartless unsympathetic rewarding for his service by supreme lord without acknowledging his pain near to death ? However, Supreme Lord Sri Ram is the only personality who is without any blemish, Shri Ram embraced Jatayu, he took him in his laps, and tears flown from the eyes of supreme Lord! And then Sri Ram bestowed him the supreme abode Vaikuntha after He cremated the bird ritually from his own hands. He bestowed such loving treatment to Jatayu which is extremely rare for others, thus Sri Ram is the personality who reciprocates with his devotees in the best possible way. Lord Sri Rama is pleased even from a small service done towards him. When Ravana abducted Sita, the vulture king Jatayu who was very old then, with all its' might, fought with the demom king Ravana without caring his own life. JatAyu was a mere old bird, How long could Jatayu match against the demon like Ravana in battle. 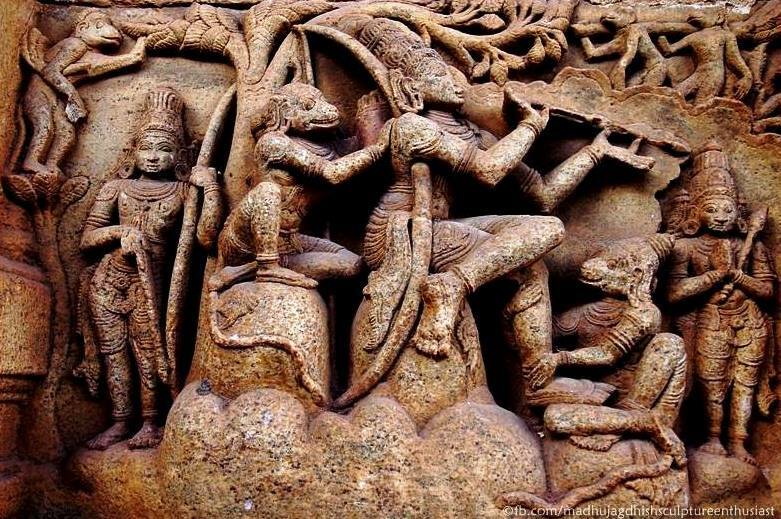 Still, the brave JatAyu tried and exerted all it's might to rescue Sita, the beloved consort of Rama. In last, RAvana cut the wings of Jatayu, and Jatayu fell down on the earth. Jatayu was about to die. That time Rama and Lakshmana came there looking for Sita. Rama got to know everything from the brave JatAyu who struggled hard to bear his life for some more moments to convey the information to Shri Rama that ten headed demon king Ravana has abduted Your wife. Then, Rama whose eyes were filled with tears for Jatayu, affectionately kept him in his lap with all love. Here, the supreme personality of godhead Rama cried for his devotee, Jatayu! "O King of vultures, by me cremated ritually and by me aptly consented to, you depart to the unexcelled heavenly worlds, you depart to those worlds that are destined for the virtuosos of Vedic-rituals who perform yajnas for a long time and to those worlds that are destined for the people who worship the Supreme Brahman by five-fires for a long time, and to those that are destined for un-retreating combatants, and to those worlds that destined for the donors of lands. You go to the planet which is unparallelled (i.e. Maha-Vaikuntha / Saket-loka)". Shri Rama gave the divine form of 4-handed personality like Lord Vishnu to Jatayu and sent him to the supreme abode of godhead i.e. Maha-Vaikuntha, the world which is unparalleled, and beyond all spiritual worlds. Is there any such compassionate Lord like Shri Rama who has even cried for his devotees? Certainly not! There is indeed none like Lord Sri Rama! Sri Rama's lotus feet are the only object always to be meditated (ध्येयं सदा)! 1. The lotus feet of Sri Ram is worshiped always by the great gods like Lord Brahmā and Lord Śiva. 2. Sri Ram's lotus feet should be always meditated. 3. Sri Rama is the Mahapurusa, the supreme personality of godhead. 4. His lotus feet are the only bark to cross the ocean of mundane existence. 5. Especially in Kaliyuga everyone should worship and meditate upon the lotus feet of Shri Rama as per Bhagavatam. śrī-śukaḥ uvāca — Śrī Śukadeva Gosvāmī spoke; kimpuruṣe varṣe — the tract of land known as Kimpuruṣa; bhagavantam — the Supreme Personality of Godhead; ādi-puruṣam — the primeval Purusa, the original cause of all causes; lakṣmaṇa-agrajam — the elder brother of Lakṣmaṇa; sītā-abhirāmam — who is very pleasing to mother Sītā, or who is the husband of Sītādevī; rāmam — Lord Rāma; tat-caraṇa-sannikarṣa-abhirataḥ — one always engaged in service at the lotus feet of Lord Rāma; parama-bhāgavataḥ — the topmost among all devotees, celebrated throughout the universe; hanumān — His Grace Hanumānjī; saha — with; kimpuruṣaiḥ — the inhabitants of the tract of land known as Kimpuruṣa; avirata — continuous; bhaktiḥ — who possesses devotional service; upāste — worships. My dear King, in Kimpuruṣa-varṣa the great devotee Hanumān is always engaged with the inhabitants of that land in devotional service to Aadi-dev (Primeval lord) Lord Rāma, who is the supreme personality of Godhead (Bhagavan), the elder brother of Lakṣmaṇa and dear husband of Sītādevī. 1) Aadi-Purusam: It directly culminates in Sitapati Bhagavan Rama alone. Who is that Aadi-purusa, so answer is given here, he is Rama, the elder of Lakshman, the consort of Sita..
2) Bhagavantam : In Bhagavatam, Lord Rama is said many times Bhagavan. 3) sītā-abhirāmam - This tells how is that original primeval Purusa, he is the one who pleases Sita, who delights Sita (Shrii-Ji). And the most irrefutable PramaNa is from Rig-Veda where Purusa is told to be husband of Shrii Ji (Sita Ji), thus Primeval Purusa from whom Viraat-Purusa arose is none other than the consort of Bhagavati Sita, Rama. 4) Param-Bhagavato: This is clear cut declaration of Shrimad Bhagavatam that Hanuman Ji is the supreme among Bhagavatas (devoted to Bhagavan), there is no comparison to Hanuman Ji, he is the best and the topmost devotee of lord. 5) tat-caraṇa-sannikarṣa-abhirataḥ :- tat (means Rama's) CharaNa (feet) Sannikarsa (nearness of, proximity of) abiratah (engaged in worship or devotion) = it means Hanuman Ji is always engaged in worship of the lotus feet of Rama, how is it possible in Dvapar Yuga? as he has nearness to the feet of Rama (Shrimad Bhagavatam was narrated around the end of DVAPARA yuga), so the feet of Rama is always available to Hanuman Ji even after a long time after disappearance of lord Rama from this earth. It is said in Puranas that Lord Rama gave boon to Hanumana Ji that whenever he (Hanuman) wishes, Rama will avail himself to him and Brahman being omnipresent is always available to his pure devotees. So everyone should be devoted to the primeval Purusa Ram as like the topmost devotee and other great divinites like Shiva, Sanat-Kumaras etc are exclusively devoted to Shri Ram. 1) Website is optimised for Firefox and Google Chrome. It may not work well with all functions in other broswer. 2) For proper viewing of Hindi fonts in your browser please switch to UNICODE, i.e in browser window goto:- "View-->Encoding-->Unicode (UTF8)"